Cory Ann Avants and Varvara Lepchenko will play for the championship of the Houston Pro Tennis Classic (HPTC) on Sunday. But the road they took to reach the finals at The Downtown Club at The Met couldn't have been more divergent, both on and off the court. Avants cruised to an easy 6-0, 6-1 victory over Bruna Colosio of Brazil in less than an hour Saturday. It took Lepchenko more than three hours and two-tiebreaks to win her semifinal against Natallia Dziadmidzenka of Belarus 4-6, 7-6, 7-6. Avants jokes that she's been groomed for the sport by her tennis-playing and -coaching parents since she was nine months old. Her family owns and operates a tennis club on their estate near Charlotte, North Carolina. 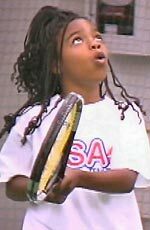 Ambidextrous, she pounds forehands from both sides and plays with a confidence belying her 19 years of age. On the other hand, and as part of an ongoing international drama half a world away, Lepchenko heart is set on seeing her mother again some day, if not her homeland. 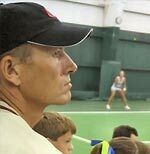 The 18-year-old Lepchenko, her father and coach Pete, and sister, Jane, sought and received political asylum from their native Uzbekistan at the 2001 Orange Bowl International Tennis Championships in Miami. The three now call Miami home, but the family is not complete. "Our mother is still in Tashkent," said Lepchenko after her win Saturday. "We've tried to get her a visa to join us here, but we are refused by the U.S. Consulate." Just two months ago, 19 people were killed in a suicide bomb blast in Tashkent. While the country, which borders Afghanistan, is considered an ally in the U.S.'s war on terrorism, the country has been beset with political upheaval since breaking away from the old Soviet Union 15 years ago. "Ninety percent of the people who live in Uzbekistan are Muslims," Lepchenko said. "My family is in the 10 percent that are Russian Orthodox." Lepchenko says she grew up accepting fear as a normal part of life in her homeland. "Every day coming home from school, Uzbeki kids would throw rocks at the ethnic Russians like me. For many years, I had nightmares." But, under the tutelage of her father, Pete, Lepchenko's tennis, if not her daily life, improved. In 2000, she finished third in the Girl's 16 division at the Orange Bowl. The next year, when she reached the tournament, she discovered that her entry had been rescinded by the Uzbekistan Tennis Federation. "The Federation had been trying to force me to change coaches," said Lepchenko. "My father had always been my coach. I think he knew something was going on. He told the Federation that he would accept being replaced, but he wanted a little time before the change." With Pete still her coach, Lepchenko found herself shut out of the 2001 Orange Bowl. But, something much bigger was brewing. Her father had decided that his two daughters and he would defect. "He didn't tell us his plan," Lepchenko said. "He was afraid we might say something to someone and ruin the whole thing. But, when we got to Miami, we received political asylum. "I don't ever want to go back there," Lepchenko said of her native country, "but, I think the U.S. wants us to go back." Lepchenko's mother, Larissa remains in Tashkent. While daughter and mother speak frequently on the phone and via e-mail, Varvara hasn't seen her mother since her defection. Ironically, it's not the Uzbekistan government that's preventing a reunion. "I don't think the U.S. wants immigrants in this country, particularly from a place like Uzbekistan," she said. "We've done everything we can think of to get my mother out of there, but we've not had any cooperation. I really think (U.S. officials) want her to stay so that we will have to go back. But, I will never go back there. "I worry about my mother's safety living in that country." For a while on Saturday, and again on Sunday during the HPTC finals, Lepchenko puts her worries to rest and focuses on tennis, a sport that has provided sanctuary for her in both a figurative and a very real sense. But victory won't truly be won until her entire family is reunited. Pete Lepchenko watches the third set of his daughter, Varvara's, win at The Downtown Club at The Met. Cory Ann Avants calls home with good news following her HPTC semifinal win on Saturday. Rice University tennis coach Julie Thu, with son Hunter, reached the HPTC doubles semifinals as a qualifier into the event. Things were looking up for some 50 Houston youngsters at the Houston Pro Tennis Classic's Kid's Clinic Saturday Morning.